A beautiful, unusual collection of photographs depicting Polly Pullar’s fascination with the countryside in all its aspects. The diverse chapters illustrate her deep passion and ‘seeing eye’ for subjects ranging from the monumental sea stacs of remote St. Kilda, to the tiniest details of back-lit floral studies. The relationship between the photographer and her subjects will delight. There is a variety of subject matter which includes landscapes, floral studies, wildlife, close-ups and domestic animals. 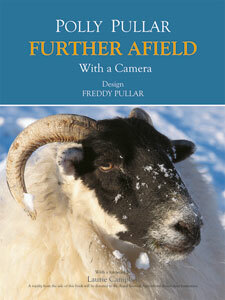 Browsing through the pages of Further Afield there is no doubt that such a body of work is the result of a life spent in close contact with animals and the countryside, viewed with an intensely creative eye.